Our journey continues!! With our stopover in Edinburgh done, it was time to board the train again! Off to Inverness! The full album of pictures can be found here! Did I find Nessie? Check out the album! 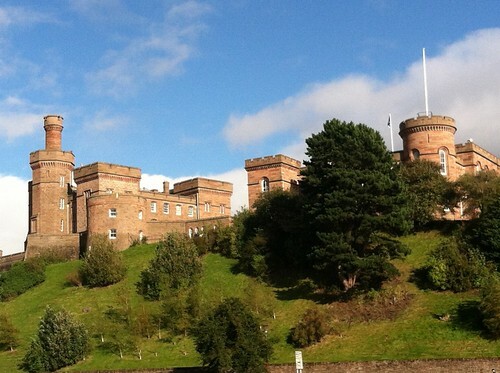 Inverness was a 4 hour train ride from Edinburgh and is located in the famed Scottish Highlands. 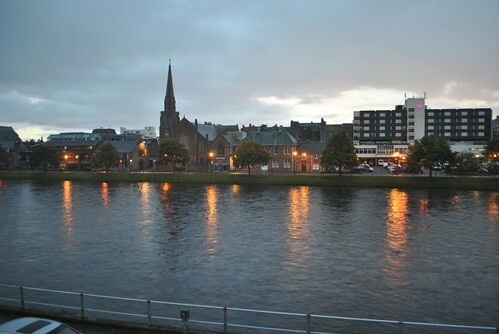 Inverness is located at the mouth of the River Ness which is the only river to flow out of the Loch Ness. 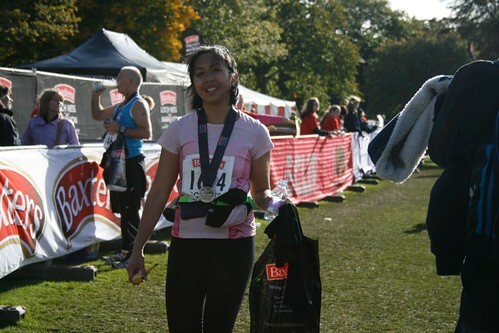 The main reason for venturing up this far in the UK was for the Loch Ness Marathon. Once we arrived and settled into our room, the magnitude of what I was about to do the next day finally hit me. I was a bit anxious. The next morning I woke up nice and early and drank my liquid breakfast. I headed out and walked silently along with some other runners along Ness Walk to the buses. It was a crisp morning and as I approached the park where all the buses were lined the full moon from the night before was still visible in the muted blue sky. 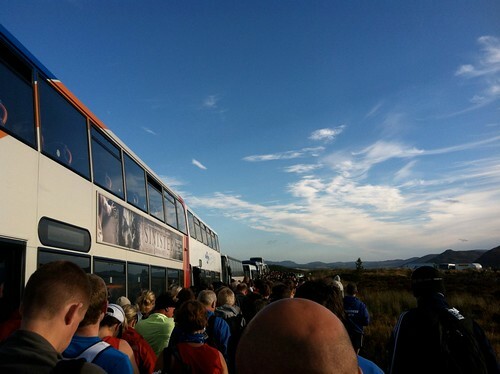 To get to the start, the buses traveled caravan style 26 miles out to the other end of Loch Ness. 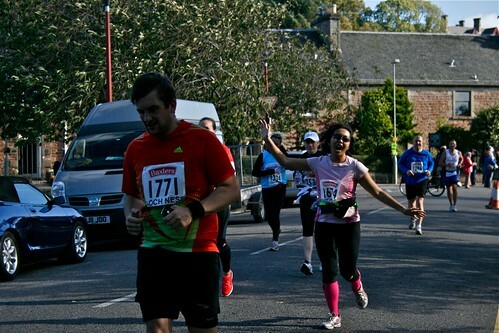 There, we were unceremoniously dumped and funneled down the road to the start. It was crazy. As we were all slowly shuffling down the road, we had to simultaneously throw our race stuff on and strip off our warm clothes, stuffing them into our baggage to be thrown onto trucks on our way to the start line. I think 15 minutes elapsed from when the buses stopped to when the race started. Or at least that was what it felt like. 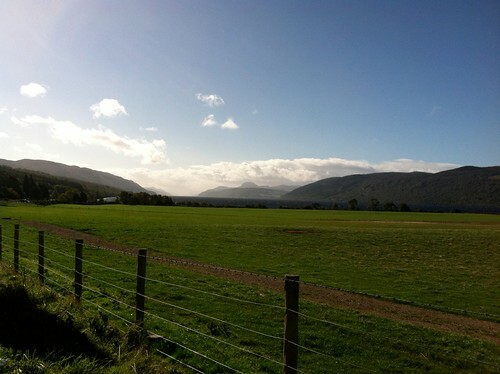 The course was remote, and ran along the Loch Ness. It was downhill in the start, but then rolling hills (many steep) after. The course was remote, and the aid stations were far apart. This definitely had a very different feel than the marathons I had done previously, although this was the first I’ve done that wasn’t a big city. I had a few touch and go moments between miles 16 and 25, but at the foot of the mile 18 hill, someone patted me on the back and told me I looked really strong and was doing great. Kind words that provide more energy than a Gel packet. As I approached the town of Inverness and spectators took on a more human form as opposed to the usual sheep, cows and horses that kept us company, I picked up the pace a bit and started spewing my more pushy American words of encouragement to those I passed (the Scottish are so polite even as they cheer people on). So there you go readers. The past 16 weeks of non stop chatter about marathon training this and that can now come to an end. Number three done, and another medal to add to the collection. 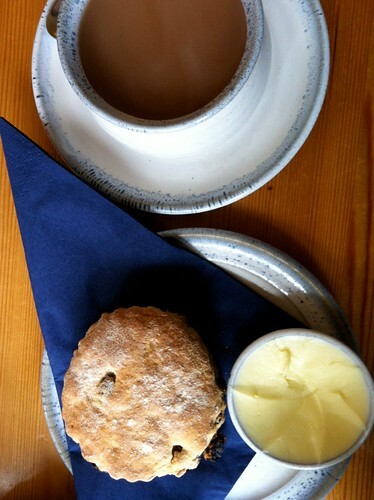 Once victory was achieved and I was cleaned up in in warm clothes, it was time to feast at one of the local pubs. It was so funny to see everyone who completed the marathon wearing their medals. I don’t think I have ever worn my medal after I was cleaned up and going out for food. My refuel of choice? Fish and chips and a nice cold pint of Belhaven Best (not hoppy, smooth and easy to drink with dinner). 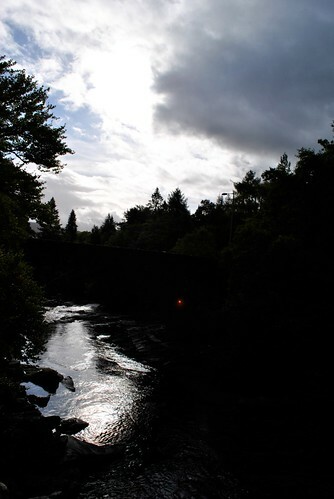 With the marathon completed, our time in the Highlands was over. it was time to start making our way back to London, with a quick stop in Glasgow. Stay tuned! 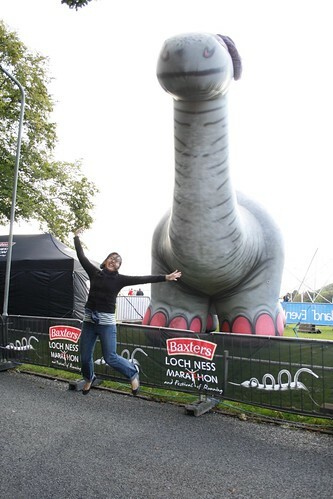 This entry was posted in Travel, Uncategorized and tagged Loch Ness, marathon, Scottish Highlands. Bookmark the permalink.